The Archer Railroad Museum is housed in the historic Seaboard Air Line depot, built around 1900. 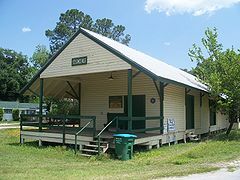 Archer was founded in 1859 as a shipping point for area farms on David Levy Yulee's newly constructed railroad and was named for Florida's first Secretary of State, James T. Archer. The museum houses memorabilia of the town's growth -- from trains and local industry to the people who have made up the community. The museum has a large photograph collection and is presently building an archive of 20th century newspaper articles about the town.